Mulch is much better than regular soil at holding onto water. Adding mulch to your landscaping before the drought season will help your yard hold onto the rain and irrigation water that it does receive for longer. As a bonus, it also helps keep weeds away from your yard. You should add extra mulch to the bottoms of slopes and wide portions of bare ground between plants. Certain areas of your yard – such as the sides of cement walkways, the areas around hardscaping, and the bottoms of slopes – are prone to creating water runoff. Instead of letting this water go to waste, put plants around these areas that will catch and make use of this water. These are good places to plant less drought-tolerant flowers and shrubs. Of course, the sun’s rays won’t be so damaging to plants if it rarely or never actually reaches them. Shade trees or arbors and other structures can protect your plants from the sun for most or all of the day. Keep in mind that some plants need constant sunlight, so pay attention to the plant’s requirements before planting it in the shade. 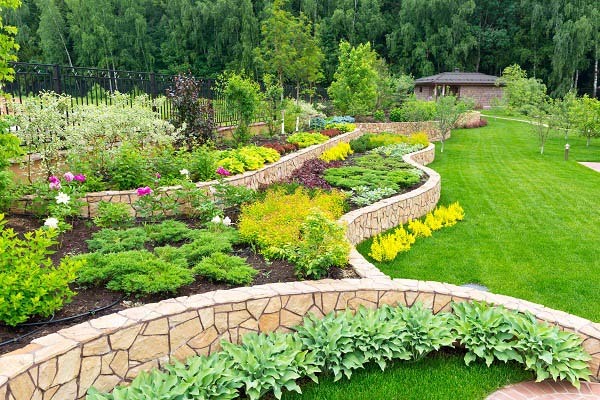 Retaining walls are a great way to conserve water when you have a sloped yard. These walls essentially add height to portions of your yard to make the area that you’re planting in flatter. Certain plants can last a while with little to no water. In areas that often experience droughts – such as Texas – it’s usually best to use native plants that have adapted to both the soil and the climate found in the area. Don’t think that “drought-resistant” means that you’ll be stuck with bland cacti, shrubs, and grasses; there are plenty of beautiful plants and flowers that are native to Texas which will add eye-catching color to your yard. If you do want to use native or non-native plants that are more water-needy, it’s best to place them in containers instead of in the ground. Grouping water-needy plants together in their own containers will help them get the amount of moisture that they require. This is not to say that you can’t put water-needy plants straight into the ground. If you do want to plant water-needy plants in the ground, it’s best to group them together and group drought-tolerant plants in a separate area. Pathways made of long strips of solid pavers or cement can work in your landscape, but they won’t help its drought-tolerance. Using a porous material such as gravel for your walkways will allow water to soak through into the soil. Another option is to make space between pathway stones or use a porous material in place of mortar to connect the stones. Plants aren’t the only way to add beauty to your landscaping; there are several additions you can add to your yard that are eye-catching but don’t need water. These include large boulders, pathways, patios, arbors, fountains, statues, or other beautiful additions. They can help to fill up your yard without adding the need for more water. A drip irrigation system is more efficient than sprinklers for keeping your yard moisturized. Drip irrigation systems waste less water and provide watering throughout the day so that your plants can take better advantage of the water. If you’re looking to get a beautiful and drought-tolerant landscape in your yard, contact Landscape By Design. They have years of experience designing and installing landscaping that is both eye-catching and able to withstand long periods of drought. Call them today to learn how they can beautify your property.